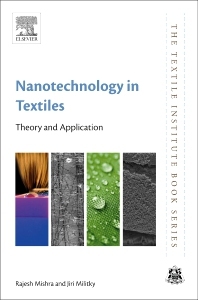 Nanotechnology in Textiles: Theory and Application explains how conventional methods for treating fabrics for specific functions can by improved upon with the use of nanotechnology. Overviews of relevant, fundamental nanophysics and nanochemistry theory are provided, along with explanations of their application in textile finishing, providing a crucial resource for readers exploring this expanding frontier in textiles. The book draws on research from around the globe to address the latest nanotechnological developments that are all examined with references to industrial applications. Rajesh Mishra is an Associate Professor at the Department of Material Engineering, in the Technical University of Liberec, Czech Republic. He is the author of over 100 SCI referred articles, 22 book chapters, and is the coordinator of several multinational research projects. His research interests include textile structural composites, nanocomposites, and biomaterial engineering of fibrous structures. Jiri Militky is a Professor at the Department of Material Engineering, in the Technical University of Liberec, Czech Republic. He is the author of 400 SCI referred articles, 50 book chapters, and is on the editorial panel of several journals. His research interests include fibers, textile material engineering, metrology, and textile chemistry.